Made of high quality environmentally friendly materials, 100% super soft Acrylic, double knitted beanie, keep your head warm and comfortable. 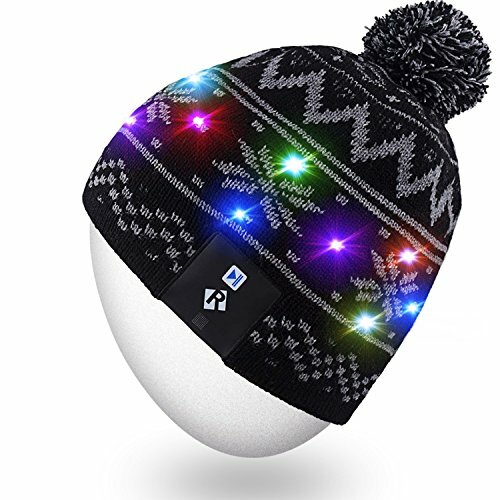 This waterproof LED string light hidden in beanie that specially designed for indoor and outdoor activities. It has 15 LEDs that generate a warm and relaxing light. As soon as you light up the light, the light creates a romantic atmosphere for celebration, festival and parties. The LED string light is controlled by improved sensitive module,you can freely swith the mode as you need to be OFF,Breathing Light or Flashing Light in different occasion. The secure,stable,environmentally friendly Li-ion battery allows you charge up to 500 or more times without having to replace the annoying disposable battery every time,and will have longer playing time. Wash the beanie after disconnecting the connection terminal and removing the module out of the pouches in the beanie.The Led string light is waterproof, DO NOT remove,disassemble or modify the light in beanie for washing. 2.Keep the connection terminal clean,remember connect the connection terminal when installation and disconnect it accordingly when removal for washing.